In January 2017 the newly elected coalition government between the social democratic PSD and the liberal ALDE under Prime Minister Sorin Grindeanu passed a decree that would have decriminalised some major corruption cases, which spurred the largest public protests since the Revolution of 1989. As a consequence, the controversial decree was withdrawn. This issue, together with rows within the PSD, led to the dismissal of Grindeanu with a no-confidence vote in parliament in June. A new Prime Minister from the PSD took office at the end of the same month; President Iohannis (former head of the opposition National Liberal Party) confirmed his appointment to maintain economic stability and to prevent the collapse of the six-month-old government. Corruption and graft remain major issues in Romanian politics and economics, and popular dissatisfaction and distrust with the political system run deep. Romania has shown robust GDP growth rates over the last couple of years, mainly driven by surging domestic demand. 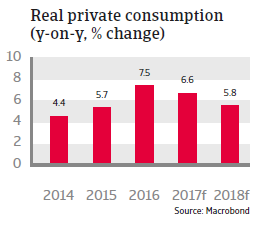 In 2016 economic growth increased 4.8%, mainly due to robust 7.5% growth in private consumption, helped by VAT reductions, low interest rates, rising wages and decreasing unemployment. 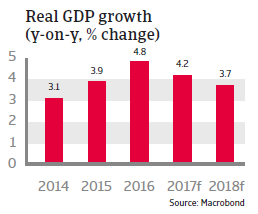 Despite the uncertain political situation in H1 of 2017 the robust growth has continued, and GDP is expected to grow 4.2% in 2017 and 3.7% in 2018, driven by continued strong private consumption and rising investments, including structural funds from the EU. 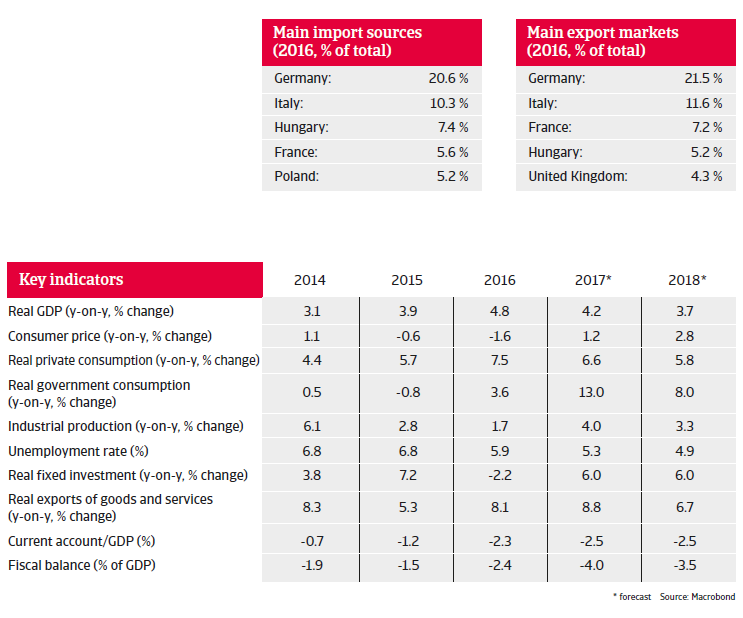 Exports, mainly to the EU, have also picked up at a reasonable rate and are expected to grow again this year above 8%. The country maintains one of the strongest growth outlooks in the region. The Romanian banking sector has continued its trend of substantial improvement in 2016, with rising capital adequacy ratios and decreasing non-performing loans. 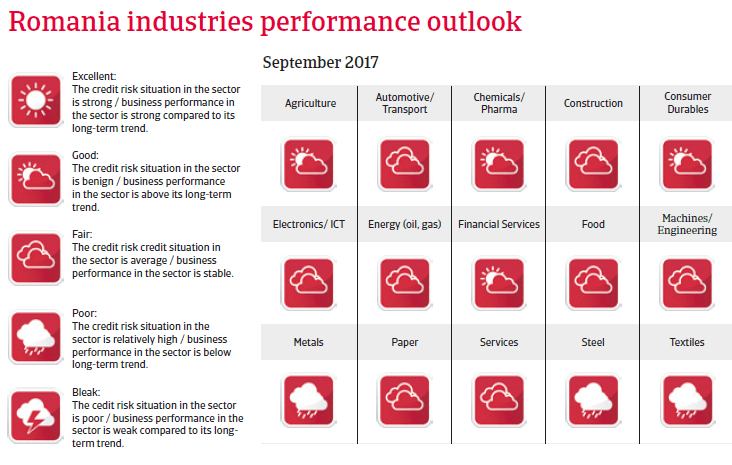 However, the sector is still subject to elevated credit risk due to foreign exchange mismatches and low credit growth. The budget deficit increased in 2016 due to the VAT reduction and the expansion of public spending in the run-up to the November 2016 general election. 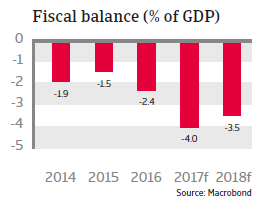 In 2017 and 2018 the deficit is expected to increase further due to the continuation of expansive fiscal policies. This leaves the government budget more dependent on a positive economic outlook, and there is still an urgent need for improving tax administration. However, at about 39% of GDP public debt is expected to remain moderate in 2017 and 2018. Romania remains exposed to some external vulnerabilities. While the current account deficit has decreased from 12% of GDP in 2008 to 0.7% of GDP in 2014 it has increased again since then as high growth in domestic demand is driving up imports. At the same time external debt is relatively high, at around 70% of GDP. The currency is subject to some volatility (e.g. the political turmoil in early 2017 caused the Romanian leu to drop to its weakest against the euro since 2012, but it has rebounded since then). While the country remains vulnerable to some capital outflows should there be adverse internal and external developments, there are some solid buffers in place – abundant international reserves (six months of import cover, low public debt and a flexible exchange rate). The short-term outlook remains satisfying, but Brexit will surely have a major impact on domestic car sales and British car exports in the mid-term.